Colorado Springs Cardiology has signed up to improve refill efficiency and patient satisfaction via AlertMD. "Alexa®, I need an MRI" - be part of that new reality or get Margie'd. Your patients don't care about ACOs, population health or whether you have the EMR with the blue button or the red button. They care about whether it is easy to work with you - PERIOD. Do not wait until your practice gets "Margie'd" by competition. Contact sales@alertmd.com and make it easier for your patients. About Margie® - AlertMD®'s ambulatory extension Margie® - is an intelligent physician office agent. She talks to your patients via the web, phone and Alexa®. No more elevator music for your patients on your clinic phone line. Margie® is a Machine-Assisted Recommendation and Guidance Engine that you configure to meet your needs. Watch this 2-minute video for a preview of Margie® here. Note - Only 23% of patient interactions come through your portal - even in a well-oiled practice. 50% of your daytime calls should not even require human intervention. 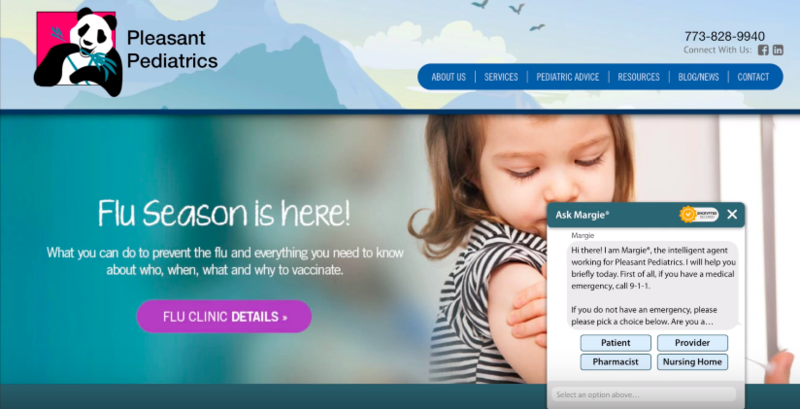 Margie® digitizes the remainder, guides more patients to your portal as you see fit and creates a centralized switchboard for all your locations. And oh, we are thinking that your patients would rather text you than call you - texting my doctor's office is so 2019. We are based in Chicago, IL and have about 20,000 customers nationwide. For more information, contact sales@alertmd.com for a 20-minute webinar to learn more. More information about Colorado Springs Cardiology can be found here. Anchorage Fracture & Ortho Clinic Picks AlertMD to innovate. Anchorage Fracture & Ortho Clinic has signed up to improve operational excellence via AlertMD. More information about Anchorage Fracture & Ortho Clinic can be found here. PrimeCare adopts AlertMD. More innovation to follow. PrimeCare® has signed up to improve operational excellence via AlertMD. "Alexa®, I need an MRI" - be part of that new reality or get Margie'd. Your patients don't care about ACOs, population health or whether you have the EMR with the blue button or the red button. They care about whether it is easy to work with you - PERIOD. Do not wait until your practice gets "Margie'd" by competition. Contact Badri Narasimhan badri@alertmd.com and make it easier for your patients. More information about PrimeCare can be found here. Margie® makes it easier to be a patient at Kidney Care Center. GI Specialists of Georgia aims to improve efficiencies via AlertMD. AlertMD's newest module Margie® - your patients can now text with your practice on their mobile phones instead of listening to your elevator music. Margie is a Machine-Assisted Recommendation and Guidance Engine that you configure to meet your needs. Watch this 2-minute video for a preview of Margie here. Note - Only 23% of patient interactions come through your portal - even in a well-oiled practice. Margie digitizes the remainder, guides more patients to your portal as you see fit and creates a centralized switchboard for all your locations. And oh, we are thinking that your patients would rather text you than call you - texting my doctor's office is so 2019. AutoCode by AlertMD - Our artificial intelligence module Cassidi® automatically reviews clinical notes and saves time for the coders. It generates suggested pro fees when there are none. We reduce the time for the pro fee to be sent to the payor by about 9 days. We have also shown a 7% reduction in CBO expenses. AutoConsult by AlertMD - We interpret requests for consult via artificial intelligence. We use our call schedule and proprietary routing algorithms to automatically send a consult to the consultant and get communication or confirmation back to the requesting provider without additional manual steps. This saves staff about 15 mins per consult and also increases patient safety by making sure every consult is serviced. AutoCoordinate by AlertMD - Our care coordination module for ACOs and managed care organizations manages risk and sends notifications for case management and intervention from the market. Our customers have worked to decrease 1% in medical expense from the enhanced workflows. When the patient wants an appointment with the provider, the provider asks the patient to set an expectation (an appointment date/time). The patient is then reminded of the appointment and asked to confirm. If they cannot make it, then the patient is asked to set a new expectation. The patient is expected to show up on time (meet expectation). If the patient cannot keep the expectation, they are asked to set a new expectation (reschedule). Quite simply, the patient wants the practice to treat them the same way the practice wants to be treated. What are your reactions? How do you manage your daytime calls? Hire more medical assistants and throw money at the problem? Do you keep your patients posted of progress? Does your portal solve all problems known to your patients? If a patient enters a message on your portal, do you tell them when you are working on it or set an expectation of a callback? What about a call during business hours? How do you handle that? The answers to these questions may drive far more patient satisfaction. This is my humble observation from dozens of patient and practice interviews. Happy to hear your thoughts. To discuss further, contact Badri at badri@alertmd.com. “What satisfies my patients?” Thoughts from 16 providers across 9 specialties in 7 States. It is a simple and yet very powerful sentiment. With more and more of physician compensation revolving around patient satisfaction, the healthcare industry is left with what looks like an elusive goal – “What satisfies my patients?”. I was all the more curious about this question myself. I spent the better part of the last 5 weeks calling customers, non-customers and anyone else who was grappling with this question. Can patients ever be satisfied? Is it a perpetual train of more and more favors and an occasional thanks with bad online ratings the moment the waiting room does not smell of vanilla? May be send more portal messages and hope that counts for us keeping in touch? Another email campaign? As I criss-crossed the country with physician practice interviews, what struck me was the amount of overhead employed to chase the elusive goal of a “satisfied” patient who will take a survey (well, one who is truly satisfied that they will share their opinion with others). As I and several of our clients started unraveling the onion one layer at a time, we stumbled upon something quite obvious. A patient today has a dizzying array of information coming at them. Many of them may start at Google® before their PCP. Yet, the physician’s front office phone is one of the busiest pieces of equipment in the healthcare industry. It is not uncommon to have ½ FTE as medical assistants/front office staff for each provider in a practice. Why is that? Even with such a heavy-handed approach to providing patient care, physician practices get flak on online message boards for being less responsive. How can that be? The FTE overload and even with that, online message board flak was prevalent across many specialties. Those interviewed for this article include primary care, orthopedics, GI, oncology, cardiology, pulmonary medicine and more. States in the country where the providers were based varied as well – IL, FL, WA, OH, LA, TX, NY and more. Throwing money at the problem seems to not solve patient satisfaction. The system seems like it needs new ideas. As I started to spend more time on what keeps the medical assistants busy, it dawned on me. I kept notes at three practices on the number of calls medical assistants took and what the matter was during the call. I then tried to piece together when the patient called and when the callback was done. It was the day after Thanksgiving and I had to call a physician practice myself to make an appointment for a family member. I tried the portal and then the phone…and waited for a few days to get the matter resolved. A few patterns started to emerge as I put my own experience together with that of the interviewees. Before I share what I learned, let me ask you…do you think you are a “satisfied” patient? What causes you dissatisfaction? To discuss further, contact Badri at badri@alertmd.com. East Texas Kidney Specialists aims to improve efficiencies via AlertMD. Heartland Health Centers Signs on to AlertMD! We are greatly humbled by the market adoption of AlertMD. Heartland Health Centers aims to improve efficiencies via AlertMD. More information about Heartland Health Centers can be found here. Pinnacle Medical Group picks AlertMD! Pinnacle Medical Group, a leading Massachusetts provider group signs on to AlertMD.